Rabbi of Rohatyn, Galicia, during the middle of the eighteenth century. He was a zealous adherent of the Shabbethaians, and, having become a follower of Jacob Frank, he was a leader of the Frankists before that party joined the Catholic Church. When internal friction among the Frankists led to public proceedings against them (June 11, 1756), Elisha was charged with being the leader of those who seduced the people to lewdness. The prosecution failed, however, to make out a strong case against the Frankists, and Elisha returned to Rohatyn. Upon the death of Bishop Dembowski of Lemberg, which took place shortly after, the Frankists lost a stanch protector; they were outlawed,and the Polish rabble began murdering and pillaging among them, Elisha being one of the first victims (Nov., 1757). Daughter of Elisha. She played a conspicuous part among the Shabbethaians, and later among the Frankists. She had an excellent knowledge of the Zohar, and whenever she fell into one of her trances she would cite it from memory. Brother of Solomon, and like him prominently identified with the Frankists, although in a lesser degree. 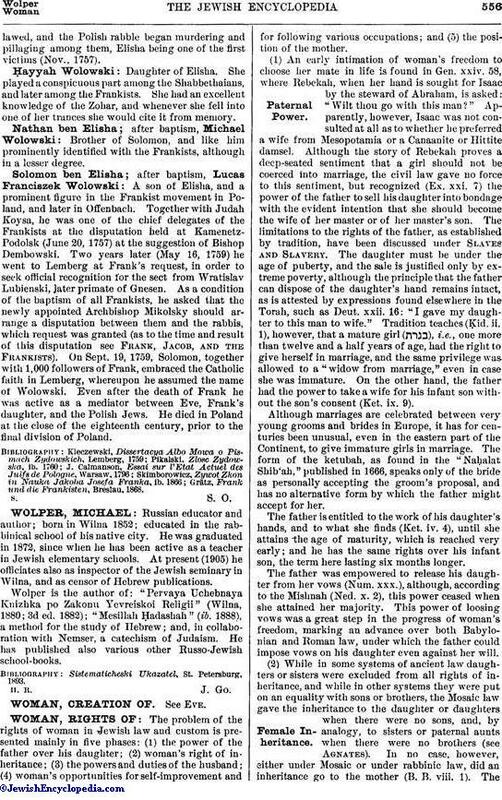 A son of Elisha, and a prominent figure in the Frankist movement in Poland, and later in Offenbach. Together with Judah Koysa, he was one of the chief delegates of the Frankists at the disputation held at Kamenetz-Podolsk (June 20, 1757) at the suggestion of Bishop Dembowski. Two years later (May 16, 1759) he went to Lemberg at Frank's request, in order to seek official recognition for the sect from Wratislav Lubienski, later primate of Gnesen. As a condition of the baptism of all Frankists, he asked that the newly appointed Archbishop Mikolsky should arrange a disputation between them and the rabbis, which request was granted (as to the time and result of this disputation see Frank, Jacob, and the Frankists). 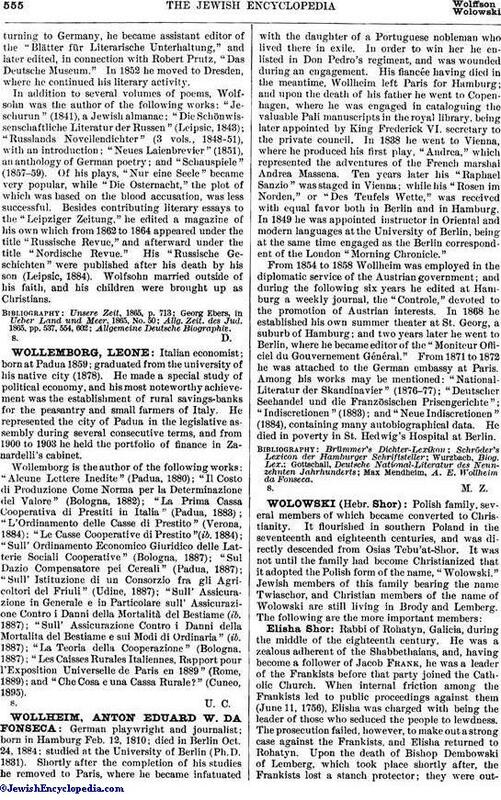 On Sept. 19, 1759, Solomon, together with 1,000 followers of Frank, embraced the Catholic faith in Lemberg, whereupon he assumed the name of Wolowski. Even after the death of Frank he was active as a mediator between Eve, Frank's daughter, and the Polish Jews. He died in Poland at the close of the eighteenth century, prior to the final division of Poland. Grätz, Frank und die Frankisten, Breslau, 1868.